Spacious home on a shady, tree covered lot. 3 bedrooms, 2 ½ baths, modern kitchen, two large decks with fabulous views of Old Hickory Lake. Huge Master bedroom with King sized bed and large private balcony. Relax on lounge chairs on the master balcony and soak up some sun. Enjoy the beautiful views directly of the water. This bedroom also has a day bed for the parents that want to bring a small child that won’t sleep alone. Playpen is also available. Private bath with large jetted tub and separate shower. Second bedroom with two twin beds is perfect for the kids. Vaulted ceilings give you the feeling of space while the large walk-in closet gives you plenty of room to put your things. The third bedroom has two double beds and its own private balcony perfect for enjoying your morning coffee while overlooking the luscious grounds. Large utility room located off the kitchen with front loader washer and dryer is there for your convenience. Large kitchen comes fully stocked with cookware, utensils and dishes or you can grill out using our onsite propane grill. Roast hotdogs or s’mores at the relaxing fire pit. Not in the mood to cook? You are only 9 miles away from popular restaurants. Family room has a large stone fireplace and a 60” TV with DVD player and satellite television. The large lower deck is covered and has an area to enjoy your meal while admiring the sunset. The home is surrounded by nature with beautiful trees and gorgeous water views. This home sits on a quiet side street with a shared drive so it is the perfect place to walk or bicycle with little traffic. There is lots of room in the front of the house to toss a football or play with the kids. Cell phone service is good outside but spotty inside and internet isn't available at this time. We encourage everyone to take this opportunity to be "unplugged" for your visit. Perfect area for swimming or fishing. We have two kayaks on the property you are allowed to use at your own risk. 10 miles to I-40, and only 22 more miles to the Nashville airport. 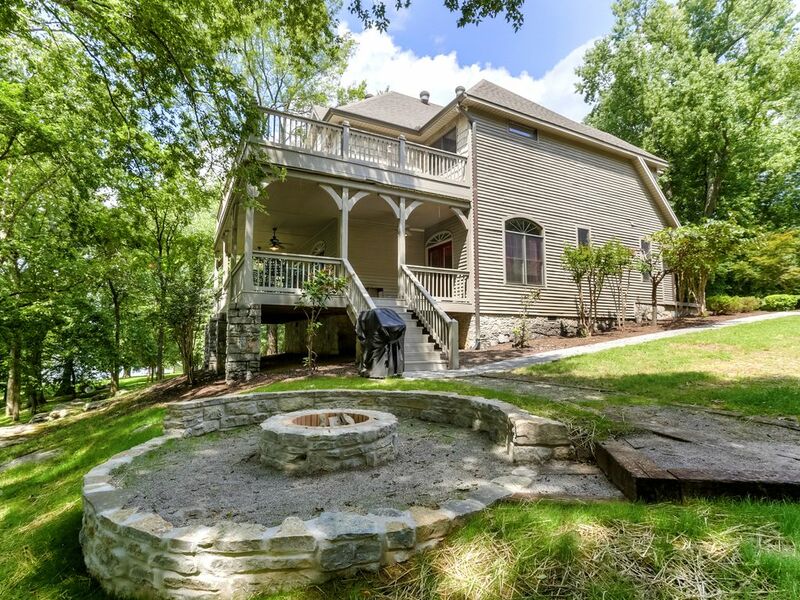 This is a wonderful place for someone that wants to get away from it all but still wants to be a short drive to shopping, movies, or all the entertainment that Nashville offers. Dining area off the kitchen with lots of additional space on covered back patio. Additional seating at the kitchen bar. Very nice place for a relaxing getaway! We very much enjoyed our stay! Very nice layout and porch overlooking the lake was beautiful! Great Property with plenty of room for 8 to 10 people during our Stay. We loved the view of the lake and all the amenities that were in the house. The large open floor plan downstairs really offered everyone time to spend with each other. Not having internet was actually a good thing, as so many of us use it daily. The only draw backs were there were no steak knives or a blow dryer in the house. I would suggest that be added to make the entire stay really great. We are so glad you enjoyed the lakehouse. Thank you for letting us know about the steak knives, they gradually disappear over time so I will get those replaced immediately. I also appreciate the comment about the hair dryer. Those are easy fixes and I will purchase both due to your suggestion. We hope you can come again soon. The house was great! It had everything we needed, in a nice quiet neighborhood and let us spend time as a family. The fishing pier provided relaxing entertainment for the family. The fish weren't biting but still a great escape. I definitely recommend this place if you are looking for a nice home at an affordable price. Thank you so much for your kind review. We hope everyone that stays has the same enjoyable experience you had when they come visit. Please come again soon. Beautiful and Peaceful!! We definitely recommend!!! My husband and I enjoyed our full week here so very much. The home is so clean and very well maintained. We were so happy to see that the owners decorated it for Christmas, as well. That was such a nice touch. The master bedroom was so very comfortable. The views of the lake are spectacular. I locked myself out one day and the owner was so nice to come right over and let me back in. We totally appreciated the sample soaps, shampoos and lotions because we did not pack ours. The drive out to the home is very very pretty. We enjoyed the ride every time we left and came back. Thank you so much for your kind words. We hope everyone enjoys the lakehouse as much as you did. Please come back again soon. Great place to stay on Old Hickory Lake. We are so glad you enjoyed your stay and hope you can come again soon.